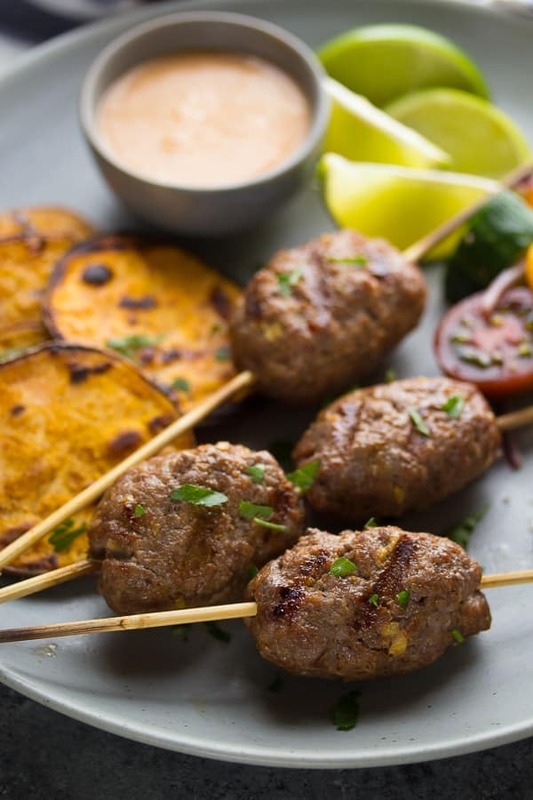 This Thai beef kofta recipe is served up with a delicious coconut sauce. A healthy and flavorful meal, ready for your family in under 30 minutes! Do things look a little different around here? Maybe a little prettier, a little brighter, and a little more organized? Sweet Peas & Saffron has had one major make-over thanks to Erin and Melissa at Wooden Spoons Kitchen! Other than the new look, this site will be much more functional. I now have a fully functional recipe index, as well as several recipe collections (slow cooker, one-pot, 30 minutes and ready in 45). I hope this makes it even easier to browse the site! If I were a little more organized, I would have made some celebratory cocktails for us. But you know me…not so organized. 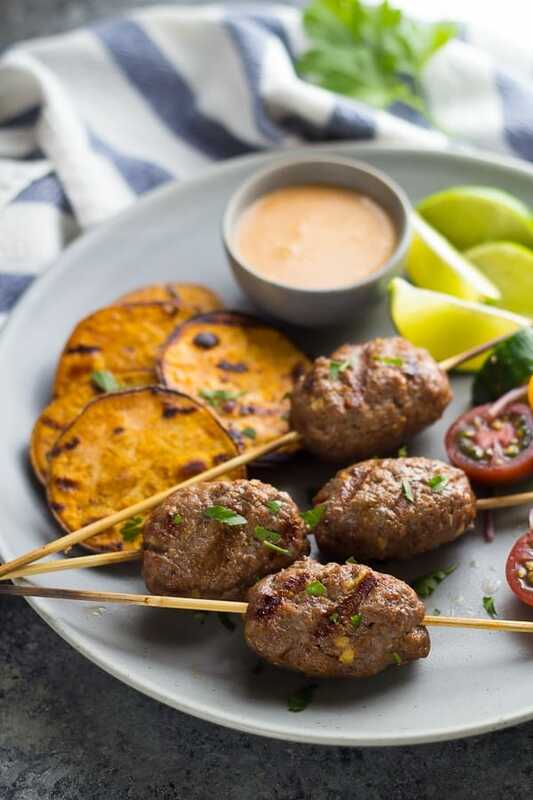 So instead I have this easy and delicious Thai beef kofta recipe for you! I feel the need to put a disclaimer here that this kofta recipe is in no way authentic. I just ripped off the idea of ‘meatballs on a skewer’ to make a fun new way to use ground beef. Because we’ve all probably eaten enough tacos, spaghetti sauce and meat loafs to last a life time. Ground beef doesn’t have to be boring at all! 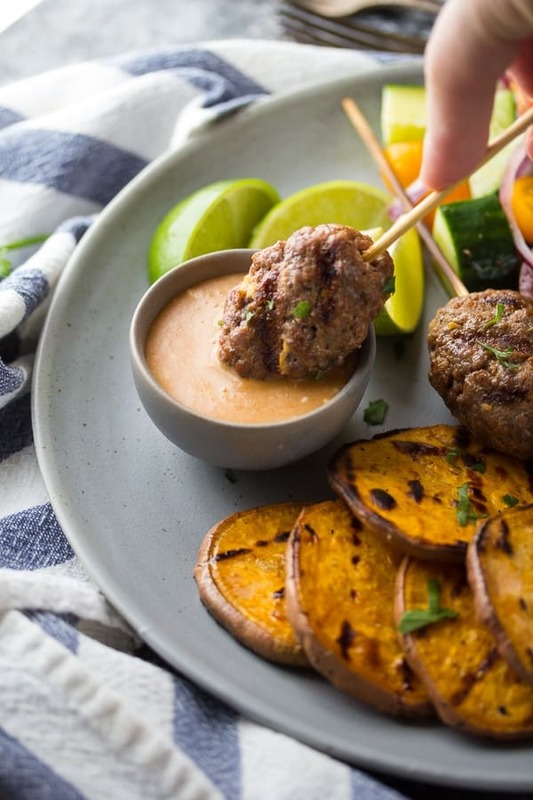 This beef kofta recipe brings the taste of Thailand to your dinner table. They are flavored with red curry paste, fish sauce, lime juice and brown sugar. 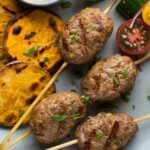 Roll them into elongated meatballs and stick a skewer through them, and you’re ready to grill! You do have to be careful with them before you get them on the grill, they are a bit delicate. But once they’re seared, you’re good. Also, make sure you don’t make them too big, any longer than 2 inches and they may be too heavy to cook on the skewer. When they were 2 inches or less, they were surprisingly easy to handle! And make sure you don’t forget to make the coconut sauce. It adds a sweetness and creaminess to the beef, and is also good for dipping veggies! Best thing: ready in 30 minutes. I know the 5pm struggle. It is real. So. New site. 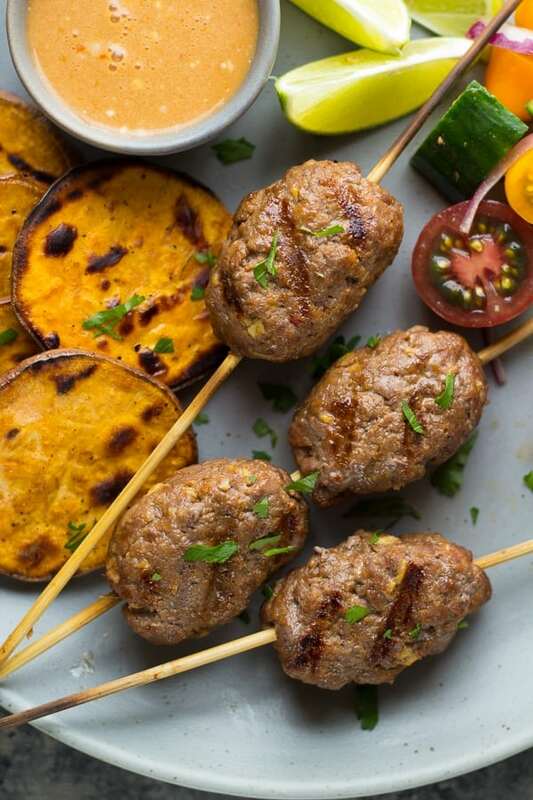 Thai beef kofta recipe. And tomorrow is Friday! Can things get any better? Would someone like to come write my thesis for me? Any takers? Shake together all coconut sauce ingredients. You may need to shake for a few min to get the curry paste completely dissolved. Set aside. In a large bowl, mix together all kofta ingredients except the beef. Whisk until curry paste is completely dissolved. Add the ground beef and mix until completely combined. Form 'elongated meatballs'. Do not exceed 2 tablespoons per kofta, as this gets very heavy on the skewer and difficult to handle/cook through. I found it easiest to mash together in my hands first, then roll out gently, then stick the skewer through the center. Grill over medium heat, turning every 2 or so minutes for 8-10 minutes, until they are cooked through completely. Hi..I am just learning to cook a few Thai dishes as my daughter and son in law love Thai food. This recipe sounds great, but is there another way to cook them besides grilling? Hi Joanne, huge apologies for my late reply! I have only tried them on the grill but I bet you could bake them, since they’re similar to a meatball. I bake my meatballs at 375 for 20 minutes, these may be a bit larger and need longer. My husband made these last night on the grill and they were great! Only thing I would have preferred the coconut sauce was a little thicker and spicier.. any suggestions? Perhaps I could try with the coconut cream and more spices. The beef itself was delicious! Hi Glenda! I am glad you liked the koftas. And I agree, the coconut sauce could have been a little thicker. I’m not familiar with coconut cream, if you try it would you let me know how it turns out? Thanks for the feedback! This looks and sounds sooo good! I love all the flavors. And I love anything coconut. Pinning! I am loving this new look! It’s so pretty! I also love these skewers! So, so delish. Thanks so much, Jessica! I am so excited to finally share it with everyone! Love the new design! It’s so bright and clean and fun! These sound absolutely delicious – especially that coconut sauce! Thanks, Ashley! I’m so excited it’s finally up! 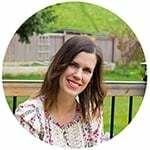 Congrats on your new blog design! I totally love it- looks great 🙂 And these koftas sound delicious, that coconut sauce is to die for! These look amazing. And I LOVEEEE your new blog design! It is perfect! Thanks so much, Mariah! I’m loving it! I love the new site, Denise! It looks fantastic! These beef koftas also look fantastic too, I love that coconut sauce. Yum! So pretty!!! I love the little icons– totally adorable! And the peapod. <3 <3 Seriously, it looks great!! Um, just stunning! Everything! I am so in love with your new design! I love the new look, Denise! I think you’re much more organized that you give yourself credit for. You just have lots going on. This recipe looks so fun! You are right, Andrea! There is only so much space in a person’s brain 😉 Thanks! Denise, I LOVE the new site design! So many new fun things to check out! Speaking of which, this beef? I can’t even. It looks SO good with that coconut sauce! It’s just gorgeous Denise! And those koftas… Yum!